Prof. Michael Keidar (EMSE) and his students published the following invited review article in Physics of Plasmas: M. Keidar, A. Shashurin, O. Volotskova, Y. Raitses and I.I. Beilis, Mechanism of carbon nanostructure synthesis in arc plasma, Physics of Plasmas, Vol.17, Issue 5, 057101, 2010. Prof. James Lee (MAE) and his graduate students have published the following paper: James Chen and James D. Lee, "Multiscale modeling of fracture of MgO: Sensitivity of interatomic potentials", Theoretical and Applied Fracture Mechanics, 53 (2010) 74-79. Prof. Joost Santos (EMSE) published a paper on modeling workforce productivity losses in the aftermath of a disaster. He co-authored this paper with his master's student, Mark Orsi. The citation is: Orsi, MJ, Santos JR, 2010. "Estimating Workforce-Related Economic Impact of a Pandemic on the Commonwealth of Virginia." IEEE Transactions on Systems, Man, and Cybernetics (Part A), Vol. 40, Issue 2, pp. 301-305. Prof. Joost Santos (EMSE) was invited by Johns Hopkins University's Applied Physics Laboratory to present a seminar on March 4th. He presented a talk entitled "Interdependent Economic Impacts of Degraded Workforce Productivity." He discussed the application of economic input-output modeling to regional disaster preparedness and recovery. This research is funded by his ongoing NSF grant. Professor Kotz was born in Harbin, China, on August 28, 1930 and passed away at his home on March 16, 2010. He was a professor and research scholar in the Department of Engineering Management and Systems Engineering at The George Washington University. He obtained his Ph.D. from Cornell University in mathematical statistics in 1960. After holding the position of associate professor since 1964 at the University of Toronto, Professor Kotz became professor of mathematics in 1967 at Temple University, Philadelphia. In 1979, he was appointed professor in the College of Business and Management at the University of Maryland, College Park. Retiring from the University of Maryland, Professor Kotz joined GW in 1997 in the then-named Operations Research Department in the School of Engineering and Applied Science. He held distinguished visiting positions at Bucknell University, Bowling Green State University, Tel Aviv University, University of Guelph, Harbin Institute of Technology (China), and Luleå University (Sweden) and was awarded three honorary doctorates: Harbin Institute of Technology (1982), University of Athens (1995) and Bowling Green State University (1997). In addition to having authored or co-authored over 150 papers, over one dozen books in the field of statistics and quality control, and three Russian-English scientific dictionaries, he was the editor-in-chief and founder of the Encyclopedia of Statistical Sciences (1982-1999) and co-author of the four-volume Compendium on Statistical Distributions (First Edition 1969-1972, Second Edition 1993-1997). He was a world authority on this subject area of statistics. He was a Fellow of the Royal Statistical Society, Fellow of the American Statistical Association, Fellow of the Institute of Mathematical Statistics, and Elected Member of the International Statistical Institute. Perhaps less well known, although no less meaningful, is the mentorship role that Professor Kotz played for many young researchers in the field of statistics or related fields over the course of his impressive career. Professor Kotz was a very inquisitive, engaging and enthusiastic faculty member who always showed great interest in the works of others. While providing support to those he collaborated with in an unassuming and encouraging manner, he instilled an intense work ethic in them by leading by example. Since 1997 and during his stay at GW, Professor Kotz co-wrote eight books and 39 journal papers. Graduate Student R&D Showcase: Don’t miss your chance to participate in the 4th Annual Graduate Student Research & Development Showcase, where you can show your R&D projects to local companies and federal labs. The event includes a poster contest with cash prizes for the best presentations: First Place = $2,000; Second Place = $1,200; Third Place = $800. The Showcase will be held on Friday, April 30, 2010, from 10:00 am until 1:00 pm in the Marvin Center’s Grand Ballroom. The deadline for applications to participate is Wednesday, March 31, 2010. SEAS Faculty Directory: The updated faculty directory is now posted on the SEAS website. You can access the directory through the "Directory" link at the top of every page on the website. Thank you to all SEAS faculty for "sitting" for your photos and updating your information for the directory. 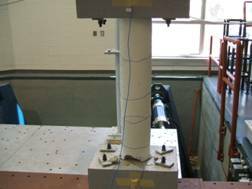 Last week, Prof. Pedro Silva and his graduate students, Linh Nguyen and John Warren, performed a series of tests on GW’s shake table to replicate the Northridge, CA earthquake of 1994. The test was covered by the local FOX and NBC news stations and broadcast on March 17th. The earthquake experiment was run in four stages, at 1/16 scale, 1/8 scale, 1/4 scale, and full scale of the Northridge earthquake. The experiment simulated a four-span bridge with three supporting reinforced concrete columns. The simulated bridge had previously been exposed to a smaller magnitude earthquake and had some repairable damage. The experiment investigated the response of bridge columns exposed to a larger magnitude earthquake after they had been exposed to a smaller earthquake. This can be thought of as seeing how bridge columns respond to a series of earthquakes and aftershocks. Video of the tests are available here and here. 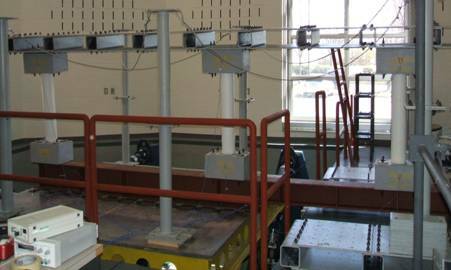 The multi-axis shake table at GW can simulate any ground motion of any recorded earthquake. It moves (translation) and can rotate in all three Cartesian coordinate system directions, giving it “six-degrees-of-freedom” motion. The table weighs 4,000 pounds and can support up to 36,000 pounds while shaking. The test specimen weighs approximately 4,200 pounds. Beneath the shake table is a massive concrete block weighing approximately 170 tons. The concrete extends 30 feet into the ground and is connected to the earth's bedrock by eighteen "H" -shaped steel rods, which stabilize the table and prevent its motion from being transferred to the building housing the table. Learn about specific competitive programs that can provide funds for doctoral dissertation research, as well as funding search strategies and tips for successful proposals.